In a new review article published in yesterday’s special section of Science focusing on the past forty years since the U.S. declared “War on Cancer,” three Cancer Research Institute scientists describe how advances in the field of tumor immunology have revealed a complex and paradoxical relationship between cancer and the immune system, and discuss how a growing understanding of this relationship is providing a scientific foundation for new therapies capable of unleashing the immune system’s protective powers against cancer. Several recent breakthroughs in cancer treatment are based in immunological principles described in the review. These include Provenge® (sipuleucel-T), a dendritic cell vaccine that received FDA approval in April 2009 for the treatment of advanced, hormone-refractory prostate cancer, the successful monoclonal antibodies Herceptin® and Rituxan® approved in the 1990s for the treatment of breast cancer and non-Hodgkin’s lymphoma, emerging therapeutic cancer vaccines, and new treatment strategies that combine standard chemotherapy and radiation therapy with investigational cancer immunotherapies. The review places these treatment advances within a scientific context spanning a century of laboratory and clinical effort aimed at learning how to direct the power of the immune system to fight cancer. During cancer immunoediting, the immune system is able to recognize and attack the most immunologically vulnerable cancer cells, i.e. those cancer cells that clearly appear dangerous to the immune system because they display molecular markers, called antigens, that identify them as damaged, secrete chemicals associated with dysfunctional cellular activity, or otherwise behave in ways the immune system recognizes to be dangerous. Schreiber, Old, and colleagues have called this first phase of cancer immunoediting the “elimination” phase. “It has long been thought that elimination is occurring all the time in healthy hosts,” says Schreiber, “where the immune system is able to destroy nascent cancerous cells before they can develop into tumors.” This process has not yet been observed directly in living animals or humans, but has been inferred by the presence of tumor-specific immune cells and antibodies found in cancer patients. In the second phase of cancer immunoediting, called “equilibrium,” surviving cancer cells continue to divide rapidly, accumulating mutational changes by chance or in response to immunological pressures that enable tumors to impair the immune system’s ability to eliminate them. Rather, a balance between immune control and tumor growth is maintained, giving the appearance of tumor dormancy. 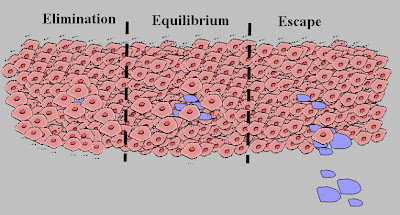 Over time, however, cancer cells can continue to undergo sculpting by the immune system and eventually enter into the third and final phase, “escape.” During the escape phase, tumor cells that have acquired the ability to circumvent immune recognition and/or destruction emerge as progressively growing, visible tumors. The switch from equilibrium to escape can be caused either by changes in the tumor cells in response to the immune system’s editing functions, or because the immune system changes in response to increased cancer-induced immunosuppression or immune system deterioration. The ability of cancers to evade immune attack has recently been accepted as one of the key defining characteristics, or hallmarks, of cancer, as described in a recent paper from Hanahan and Weinberg published earlier this month in Cell. How cancer evades the immune system is still a topic of intense research, as Schreiber, Old, and Smyth describe in their review. “Some cancer cells stop signaling danger to the immune system through loss of the ability to process and present surface markers that help identify them to the immune system,” says Old. Without signals that differentiate them from normal cells, these cancer cells become “invisible” to the immune system. 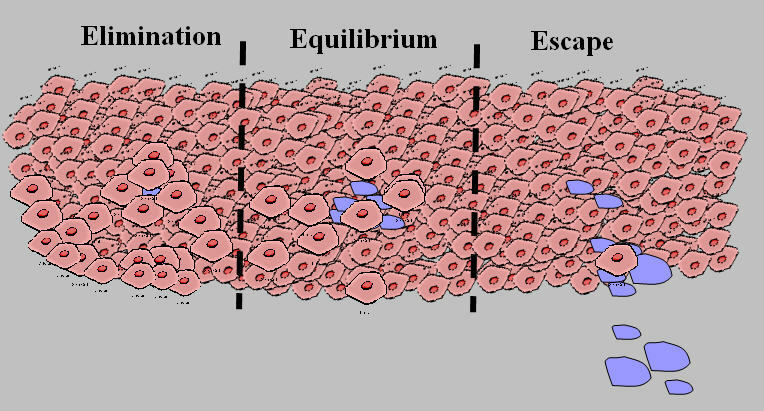 Another channel for tumor escape is opened when cancer cells establish an immunosuppressive state within the tumor microenvironment. According to Old, tumor cells initiate a process involving a complex network of regulatory cells and molecules that can effectively shut down immune recognition and control of the tumor. This process normally functions to prevent the dangers of autoimmunity, a state where the immune system attacks and destroys normal cells of the body. 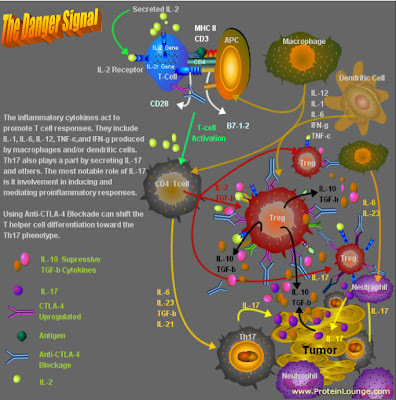 A key immune cell involved in inhibiting immune responses in both tumor immunity and autoimmunity is the regulatory T cell. Studies of tumors infiltrated with immune cells have demonstrated a clear relationship between the ratio of regulatory cells to effector, or cell-killing, immune cells and overall patient prognosis, with those having fewer regulatory cells faring better than patients whose tumors are more immunosuppressive. According to the paper’s authors, to be effective, cancer immunotherapies will have to increase the quality or quantity of immune cells capable of eliminating cancer cells, reveal additional protective tumor antigens, and/or eliminate cancer-induced immunosuppression. Multiple forms of immunotherapy are being explored to achieve these objectives, including therapeutic cancer vaccines, adoptive transfer of tumor-specific immune cells, monoclonal antibodies that target cancer cells for elimination, and approaches that inhibit or destroy molecular or cellular mediators of cancer-induced immunosuppression. The authors point to future work in cancer immunoediting that will address questions like: which components of the immune system play a role in each of the three phases of cancer immunoediting and how, what are the specific differences between tumor antigens on immunoedited cells compared to unedited tumors, is it possible to predict how a tumor will be immunoedited based on the types of antigens that are expressed, is a durable state of immune equilibrium a desirable and attainable endpoint for cancer immunotherapy, and how can we most effectively inhibit cancer-induced immunosuppression at the tumor site without inducing autoimmunity? Finding answers to each of these important questions will provide tumor immunologists with further insights needed to optimize immunotherapies for use in treating cancer patients. In 2007, the Schreiber, Old, and Smyth jointly received the Charles Rodolphe Brupbacher Prize for Cancer Research for their joint and complementary contributions to the field of cancer immunology and, particularly, to a better understanding of the concepts of cancer immunosurveillance and immunoediting. The three scientists also received the Cancer Research Institute William B. Coley Award for Distinguished Research in Basic and Tumor Immunology: Old (1975), Schreiber (2001), and Smyth Smyth (2002). With the setting of the tumor’s microenvironment evaluated, we will focus the low survival immunotype A patients. How can we improve the overall survival and the immune response to Melanoma? These therapies work well in a subset of melanoma patients but the overall survival rates are still quite low. We need to somehow combine these immunotherapies with a cancer vaccine to invoke an immune response with memories T-cells so we can eliminate any reoccurrence. Oncologists have been working on this for decades. Dr. Mills and colleagues discovered that if you combine a PI3k inhibitor with TRL agonists (TRL-9 and or 5) with DC vaccine/tumor antigen, you invoke a tremendous immune response along with memory cells. This combination actually tilts the T-cell differentiation towards the Th1 phenotype that is needed to activate the CD8+ T-cells. I believe this is a major breakthrough toward curing/stabilizing the Melanoma Cancer. humoral and cell-mediated immune responses. In addition, TLR ligation results in the production of IL-6 by DCs, which helps overcome the suppressive effect of CD4 CD25 Treg cells. We must break the tolerance to generate immune responses against the tumor antigens. This combination developes a population of polyfunctional T-cells that produce interferon-gamma and IL-17, both potent mediators of the immune response. Moreover, the combination has a lasting effect. This combination also produces the “Danger Signal” that is needed to recruit the immune cells to the tumor’s microenvironment. A fledgling startup company (Trimod Therapeutics) holds the patent to this technology. As stated in my previous post, we need a cancer vaccine with Anti-CTLA-4 and IL-2 to produce a lasting immune response. I believe this company holds the future of immunotherapy cure/stabilization for Melanoma and maybe more cancers. Only time will tell with the right Clinical protcol in place. This is years away, but holds a temendous promise due to the science behind it. We need to expidite this rationale for the good of the Cancer patients. Purpose: Treatment with ipilimumab can cause objective tumor responses in patients with metastatic melanoma. We have treated 177 evaluable patients in three clinical trials and have long-term follow-up to evaluate the durability of responses. Patients and Methods: Patients with metastatic melanoma were treated in three trials from 2002 to 2005: In Protocol 1, fifty-six patients received ipilimumab with gp100 peptides. In Protocol 2, thirty-six patients received ipilimumab with interleukin-2. In Protocol 3, eighty-five patients received ipilimumab with intra-patient dose escalation and were randomized to receive gp100 peptides. We have analyzed their long-term follow-up and survival data. Results: With median follow-up for Protocols 1, 2, and 3 being 92, 84, and 71 months, median survival was 14, 16, and 13 months with five-year survival being 13%, 25%, and 23%, respectively. Patients in Protocol 2 had a 17% complete response (CR) rate, compared to 7% in Protocol 1 and 6% in Protocol 3. These CR rates are higher than previously reported for the same trials because some patients who eventually became CRs had continual tumor regression months to years after therapy. All but one of the 15 complete responders are ongoing at 54+ to 99+ months. Conclusions: This report provides the longest follow-up of melanoma patients treated with ipilimumab and shows that ipilimumab can induce durable, potentially curative tumor regression in a small percentage of patients with metastatic melanoma. 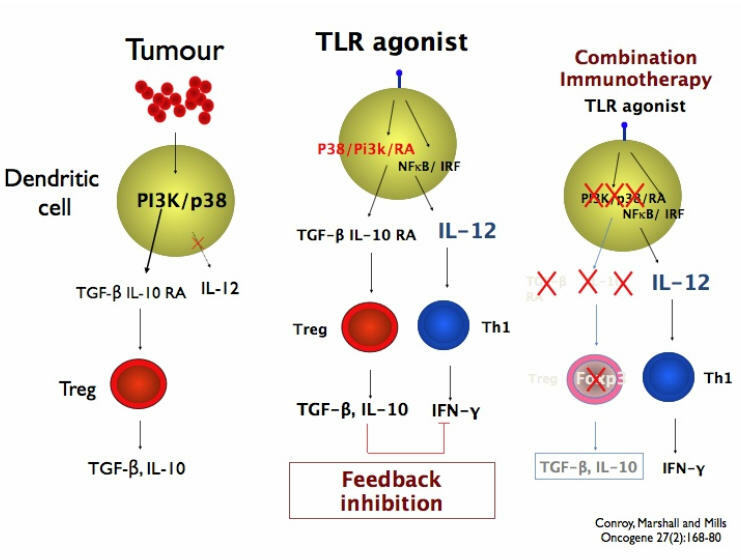 The combination of ipilimumab and IL-2 appears to have an increased (CR)Complete Response rate, but this needs to be tested in a randomized trial. 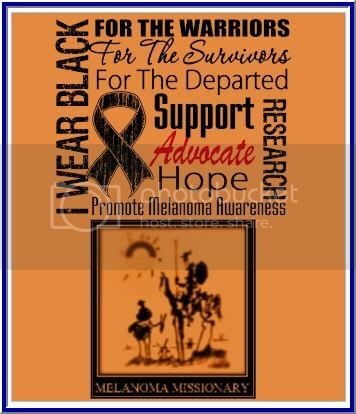 If you have been following me on Carepage and or Melanoma Missionary, we knew about this combination back in 2009. I have been pushing for this trial. I even wrote and posted an email to Dr. Steven A. Rosenberg on 3/29/2009 at NCI. 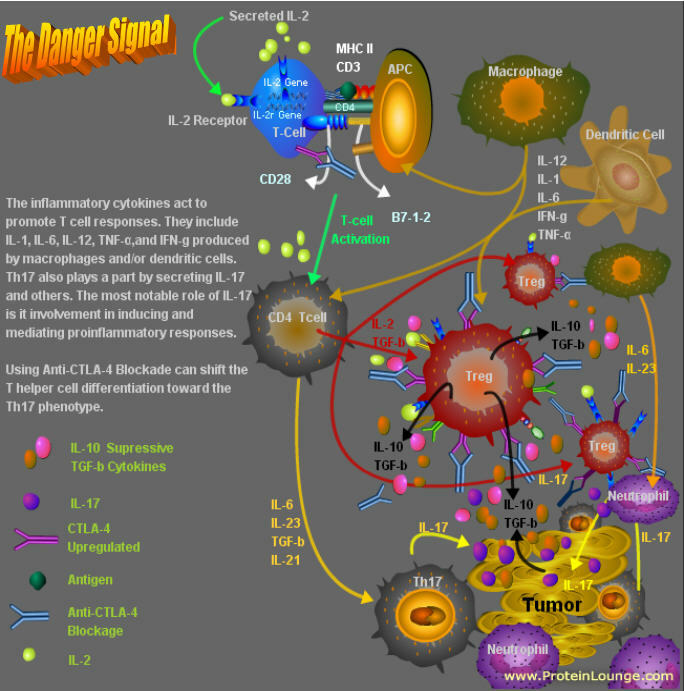 "To summarize, Timing and Doses of both Anti-CTLA-4 and IL-2 can have a major effect on the immune response outcome. If you follow the dosing and timing regime, I postulate that you will see a synergist outcome with this combination therapy." I have learned a lot through my researched and still believe that my systematic combination theory of Anti-CTLA-4 and IL-2 still holds water. In fact as we speak, I am reseaching the tumor's microenviroment to see how we can improve on this response rate. How the tumor operates in the neighborhood of cells. How it changes the neighborhood with Cytokines, Tregs and cell to cell contact. It is simular to having one bad apple in the basket and how it causes other bad apples. And By adding Cancer Vaccines to this combination, I believe we can CURE Melanoma. "Activating the immune system for therapeutic benefit in cancer has long been a goal in immunology and oncology. After decades of disappointment, the tide has finally changed due to the success of recent proof-of concept clinical trials. Most notable has been the ability of the anti-CTLA4 antibody, ipilimumab, to achieve a significant increase in survival for patients with metastatic melanoma, for which conventional therapies have failed. In the context of advances in the understanding of how tolerance, immunity and immunosuppression regulate antitumour immune responses together with the advent of targeted therapies, these successes suggest durable and long-lasting response in cancer patients." 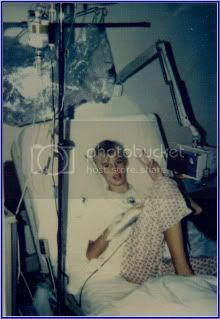 We as patients of the Clinical trials are right in the middle of this awakening!!! !